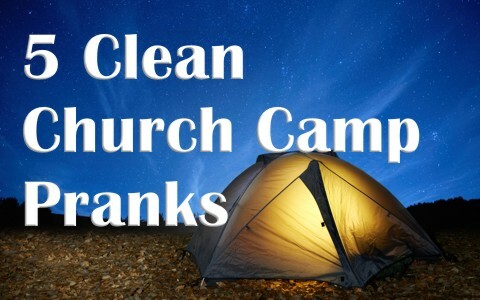 Here are five really great, clean church camp pranks you can play on others. A note of caution, any pranks you choose to use at a church camp or retreat should never, ever come close to hurting or injuring someone and even if there’s a risk, I suggest you don’t do it. It’s never fun when someone gets hurt or humiliated before their friends or the church camp. Of course, that advice would apply to anywhere you are and not just with church activities. It’s never fun when someone gets hurt, but it’s also important to never play any kind of joke or prank on someone that’s dirty, insinuates evil, or something that is aimed at a specific group of people. If we do, we are basically condoning evil. You can have a lot of fun with water balloons, as long as you’re not near any electrical outlets. Try putting a water balloon in someone’s shoe or coat pocket. If a coat pocket, wait till they put it on and pop it as you go by. These can be placed on the top of open doors (again, watch the electrical outlets) but not if it would harm wood floors or stain walls. Most water balloons are harmless fun…it’s more about getting someone wet by surprise than humiliating them. Have one ready when you’re outside and quickly toss it at them without their having time to think about it. Their natural reaction should be to catch it…and get wet. You can even hide behind trees and launch them secretly. The campers will wonder where and who it’s coming from. But again, please be careful of adults, people’s laptops, tablets, or cell phones. How about shaking one of the camper’s hands…but with a piece of banana it your hand so when you shake hands with them, it squished between your grip and theirs. No harm…just a bit messy, but good clean fun. Naturally, you wouldn’t want to get a banana all over them or their clothing or their blankets or their bed. Certainly, not in their sleeping bag so keep this out in the open and have some paper towels handy to let your friend clean up their hands. One boy suggested you can slip slices of bananas into someone’s chair, just before they sit down. I think that was the same boy that got me once in camp when I put my feet into my shoes and found mashed bananas. I cleaned them out but I smelled like bananas all day. I got over it. My friend laughed a lot about that…and later, I laughed too! No one got hurt. Super glue a coin on the sidewalk or porch at night so no one can see it until daylight and it’ll have time to dry. When someone sees it in the morning, they’ll try to casually pick it up but can’t…and then they’ll try again…and again, but never be able to pick up the coin. This works with lots of different people (innocent victims everywhere!). This can work just about any place you have a solid surface, but not indoors, as the glue can damage the floor. It can work near swimming pools or sidewalks, and steps. When everyone’s asleep, get up and move the clock or clocks in the cabin you’re staying in, forward one hour. When everyone gets up to go to breakfast, they’ll discover they’ve got a lot more time on their hands than they thought. Ask them to check their watches. When they first wake up, tell them their late for breakfast….and they’ve got to hurry up. Maybe the extra time waiting for breakfast can be used for a Bible study. Slip some gummy worms into someone’s meal and see how they react when they discover that what they’ve been eating has worms….and it might look like an actual worm, depending on what the food is. It works great in oatmeal or just about any breakfast cereal. It also works great in mashed potatoes or any other soft food that prevents the gummy worms from being seen. There are limitless possibilities…drop them into soft drinks, coffee, milk, and even orange juice. These are harmless ways to have a little fun but we should remember to take these kinds of jokes or pranks if we’re dishing them out. If the camp director does say, “Put an end to it,” then by all means, listen to them and stop the pranks or practical jokes. Now verbal jokes are great…there is no limit to how much fun you can have with these….if, and by all means, only if they are clean and there are no sexual or sinful overtones to them. Here is one more I like. When you push Alternate + Control + the “down” arrow, the screen will flip upside down. To fix the problem, just do the opposite; push the Alternate + Control + the “up” arrow. This really messes with their head when they turn on the computers, if there’s a computer lab available. If there is, and someone’s stepped away for a moment, hit control, alternate, and the up arrow and when they come back, they’ll find everything’s upside down on their screen and they’ll have no clue how to fix it! This doesn’t hurt anything in the computer and it’s a cheap, easy gimmick to play on your friends. Be sure to be a good sport when or if someone pulls a prank or joke on you. I believe it’s healthy to laugh at ourselves and laugh with others, but not laugh at others. No joke is worth humiliating anyone. It’s best when these are just between you and your friend. You don’t want to embarrass your friend in front of a huge audience. That’s not funny. Just make sure you don’t you’re your good, clean prank or practical joke into a bad situation where nobody’s laughing. Next post: How Many Children Did Job Have?